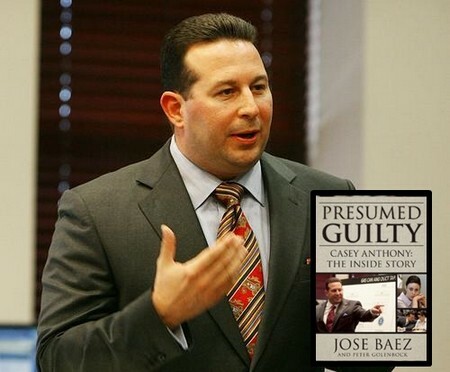 Jose Baez who’s known for being the attorney of murder mom Casey Anthony has written his own book to tell the world what happened from his point of view. According to Radaronline, at some point in the book he actually mentions that his client’s car smelled like a “dead body!”. His book, just in case you’re interested in knowing, is titled “Presumed Guilty, Casey Anthony: the Inside Story”. I can tell you one thing, this is not a book I will be running out to buy. Consequently, Jose had his answer and did not need to talk to Casey about taking a plea. This isn’t looking good for Casey Anthony, we heard back awhile ago she wanted to live a quiet and peacefully life away from everyone. But now that there’s a book about her whole case revealing a lot of details, my guess is that she will continue to run, but I doubt if she will be able to hide. What do you think about Jose’s claims of smelling a dead body in Casey Anthony’s trunk? Is he just trying to sell books and wants to shock people into buying them? Accused Murderer And Monster Mom Casey Anthony Says She’s Pregnant!